The Defending Public Safety Employees Retirement Act of 2015 amended the Internal Revenue Code to allow specified federal law enforcement officers, customs and border protection officers, federal firefighters and air traffic controllers who separate from service during or after the year they become age 50 to make withdrawals from the Thrift Savings Plan (TSP) without incurring a 10 percent early withdrawal penalty. This column discusses what the new law means to federal employees who are eligible to take advantage of the new law. It is important to first review the rules regarding “early” distributions from a qualified retirement plan. Early distributions – those distributions made before age 59.5 – from a traditional IRA and a retirement plan such as a 401(k) retirement plan, a 403(b) retirement plan and the TSP are generally subject to a 10 percent penalty, in addition to federal income taxes and in most states state income taxes. But the law provides an exception for withdrawals from company sponsored qualified retirement plans (401(k), 403(b) plans and the TSP) for employees who separate or retire from service at age 55 or older. Another exception exempts from the 10 percent penalty certain public safety officials – this includes state and local police officers, firefighters and emergency medical services workers – who separate from service at age 50 or older. The exception applies only to state and local government-sponsored defined benefit plans. Until 2016, the exception did not apply to defined contribution plans including 401(k) or 403(b) retirement plans. Among the provisions of the Defending Public Safety Employees Retirement Act is that it expands the definition of a “public safety official”. Under the prior law that was in effect through Dec. 31, 2015, public safety officials only included state or local public safety employees. Federal public safety employees, even those who had essentially the same jobs as state and local public safety employees, were not included in the definition of a public safety official. Federal public safety employees who retired before age 55 such as law enforcement officers (LEOs) and firefighters (and many did) could receive their CSRS annuities or FERS annuities with no early withdrawal penalty. This is because the CSRS annuity and the FERS annuity are federal government-sponsored defined benefit plans. In addition to expanding the definition of a public safety official, the new law extends the availability of the age 50 exception to include distributions from governmental defined contributed plans, such as the TSP. Until the effective date of Jan. 1, 2016 of the new law, any federal public safety officials such as LEOs, air traffic controllers, customs and border protection officers, and firefighters who retired before age 55 would receive penalty-free CSRS annuities or FERS annuities. But these individuals had to wait until age 59.5 in order make penalty-free TSP withdrawals. The new law changes that. Example 1. Harry is a federal law enforcement officer who retires April 30, 2016 at age 49 with 25 years of federal law enforcement service. Harry cannot take advantage of the new law because he retired in the year before he became age 50. Example 2. Sarah is a firefighter who retires April 30, 2016 at age 52 with 20 years of federal firefighter service. Sarah can take advantage of the new law. It should be noted that the new law applies only to governmental defined contribution plans and not to traditional IRAs. TSP participants are permitted to make a one-time transfer of a part of their traditional TSP account to a traditional IRA. Many annuitants at some point after they retire from federal service make a one- time transfer of a part of their traditional TSP account to an IRA in order to utilize the more flexible withdrawal options of an IRA. Note that in order to make penalty-free (no 10 percent penalty) withdrawals from a traditional IRA, the IRA owner has to be at least age 59.5. But pre-age 59.5 penalty-free IRA withdrawals can be made in a series of substantially equal periodic payments (SEPPs) in accordance with Internal Revenue Code section 72(t). 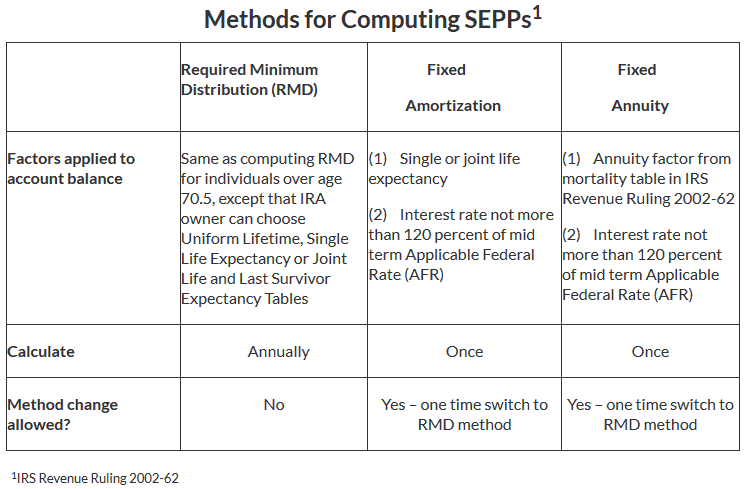 SEPPs must be made computed based on the IRA owner’s life expectancy or the joint life expectancies of the IRA owner and his or her designated beneficiary and must be made at least annually. Note that distributions made under the SEPP exception must continue for the later of: (1) The date the IRA owner becomes age 59.5; and (2) The close of the five year period beginning on the date the first payment was received. Most accountants and financial planners have software that computes the SEPPs using the three methods. Example. Steve, a federal law enforcement officer, retires at age 54 on April 30, 2016 with $500,000 in his traditional TSP account. He directly transfers $200,000 of his TSP account to a traditional IRA. With the remaining $300,000 in his TSP account, Steve can at any time request penalty-free TSP fixed monthly payments. Once started, the TSP monthly payments must continue. The amount of the monthly payment can change from year to year. If Steve wants to make penalty-free IRA withdrawals this year when he is age 54, then Steve can do so using one of the three SEPP methods shown in the table above. The IRA payments must continue until at Steve is at least 59.5 (which is later than five years when Steve started to make IRA withdrawals). At age 59.5, Steve can stop the IRA withdrawals if he wants to. TSP participants who retire before age 55 have one other option to make penalty-free TSP withdrawals. That is with a TSP annuity that is purchased through the TSP from Metropolitan Life Insurance Company. The disadvantage to a TSP annuity is if the TSP participant wants to receive the maximum income from a TSP annuity (called a “life annuity”), then the same monthly payment will continue, with no cost-of-living adjustments or survivor annuity benefit. Also, upon the death of the TSP annuitant any funds remaining in the annuity will be kept by Metropolitan Life Insurance Company. On the other hand, with penalty-free TSP monthly payments anything remaining in the TSP account at the death of the TSP participant will go to a TSP beneficiary. If a TSP participant younger than age 55 has chosen a TSP annuity as a means of making penalty-free withdrawals and wants to give whatever remaining in the annuity to a beneficiary upon the death of the participant, then Metropolitan allows the participant to elect the annuity’s “cash refund” option at the time of buying the annuity. But that “comes with a price” – the participant will receive less of a monthly TSP annuity payment. Needless to say, the major challenge associated with penalty-free TSP and IRA withdrawals available to federal and state public service employees who retire before age 55 is that their defined contribution plans and traditional IRAs have to last throughout their retirement, for as many as 35 to 45 years. For that reason, federal public service retirees need to be careful and not withdraw too much of their TSP accounts too early in their retirement in order to avoid the risk of “outliving” their TSP account. Most importantly, whatever remains in a public safety official’s TSP account and not withdrawn has to continue to grow tax-deferred, with perhaps as much as 50 to 60 percent being invested in the three TSP stock funds – the C, S and I funds – in order to both sufficiently grow and to overcome inflation.